Oregon Grape (Mahonia varieties). Choose from a range of robust and reliable Mahonias to provide evergreen foliage and golden seasonal flower, followed by black grape-like berries in spring. Good AGM varieties include ‘Winter Sun', ‘Apollo' and ‘Charity' among many others. Camellias in bloom. Few hardy shrubs signal the end of winter better than camellias, highly valued for their stunning floral displays and fresh, glossy, evergreen foliage. With dozens of varieties available you'll be spoilt for choice, so pick from camellias in shades of pink, red, white and cream. Primulas in bloom. Plant a rainbow of colour to welcome in spring by packing patio pots and filling flower beds with primulas and polyanthus. These cheerful bedding plants offer great value, flowering their hearts out for weeks on end to brighten your outlook on even the dullest of days. Japanese maples. 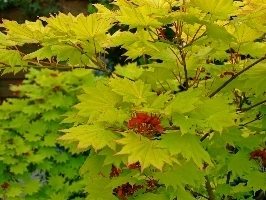 They are the perfect choice of tree for any small, compact or courtyard garden. Their character and appeal makes them ideal for creating a focal point in your garden, brightening a shaded corner, or elegantly overhanging a pool or water feature. Chives in flower. Create your own culinary herb garden that looks almost too good to eat! Try planting a selection of tasty herbs valued as much for their ornamental appeal as their flavour. From sage to thyme, rosemary to clipped bay and flowering chives, combine herbs valued for their ornamental beauty to produce long-lasting displays as well as regular pickings for the kitchen. Clematis. From bold blooms the size of tea plates to delicate nodding bells adorning a garden arch, clematis are versatile and colourful climbers that no garden should be without. Whether left to clamber-up a trellis panel to cover walls and fences or trained over a pergola, clematis are a wonderfully diverse family with varieties to choose for flowers in every season of the year. Butterflu Bush (Buddleja). Add a new dimension to your garden displays by not only planting colourful flowers you can enjoy throughout the year, but ones that will bring in the butterflies too. A wide range of bedding plants, perennials, flowering shrubs and bulbs produce the simple, open blooms that butterflies love. Ornamental grass - Pennisetum setaceum 'Summer Samba'. From dainty Blue Fescue Grass to majestic Miscanthus, ornamental grasses provide texture, character and form unmatched by many other hardy perennials. Their presence develops through the seasons as bright and colourful foliage is joined by graceful swaying flower heads that last well into winter. Verbena bonariensis. Add fresh excitement to your autumn displays by including a selection of seasonal stunners to flower beds and patio pots. Several hardy perennials have been patiently growing all year, waiting for their turn to take centre stage. And now their time has come to burst into bloom, filling our gardens with vibrant colour. Firethorn with red berries (Pyracantha). Berry-bearing trees and shrubs come into their own in autumn, creating colourful displays that can last well into winter. From elder berries to rose hips, crab apples to firethorns, the addition of berrying plants adds to a new dimension to any garden, with plants carry fruits and berries through autumn and into winter. Red-stemmed Dogwood (Cornus variety). To create a beautiful garden with year-round appeal it's essential to pick the best plants, and few celebrate the seasons more than colourful cornus. Commonly called dogwoods, these reliable and hardy shrubs provide a luscious leafy backdrop to summer flowers. As a final fanfare their foliage is transformed into a rainbow of colours through autumn before fluttering away to reveal brilliant wand-like stems. Holly varieties (including Ilex 'Golden King'). It will soon be Christmas, and what better way to celebrate the season and bring festive cheer to your garden than with two traditional Christmas favourites - Holly and Ivy. Countless cards carry their image, often with leaves touched by frost or covered with a crisp layer of snow, and your garden displays will have even greater appeal.